This is just going to be me bitching, fyi. 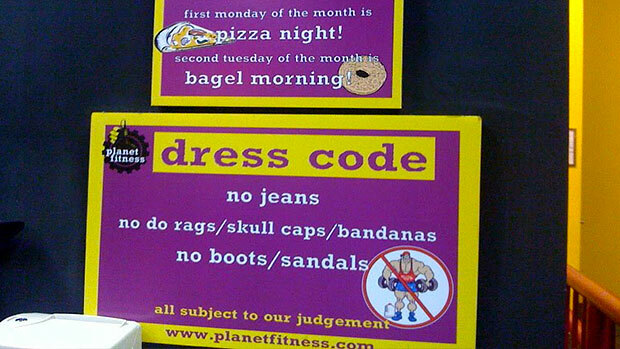 You know, since I joined Planet Fitness for the third time I have tried to have a relatively good attitude about it, despite generally hating everything the mega-gym chain represents. Well today the cup ran over and I just found myself incredibly perturbed most of my workout. I even commented to my bench press buddy “dude, there are so many douche bags here” He agreed. My bad mood got kicked off by this short and stocky hispanic guy. The sides and back of his head was shaved with it long on top, as is the style. He added his own flair by having a mini-man bun up top which was really sharp. He was on the multi-function cable station doing standing chest flies. However, instead of assuming a starting position that just raised the weights off their stack, he felt it necessary to keep inching forward until his body was a good six feet in front of the machine. Him assuming this position totally blocked one of the two paths to the back section of the gym, the other partially blocked by weight benches relocated for the painters. The irritation didn’t stop there. As he moved onto other exercises, all on the same machine he used awful momentum for every rep, letting the laws of physics do most of the work for him. It seemed once hair bun guy got me going the irritation just piled on. There is some guy wearing those ridiculous white Beats headphones with the headband rotated backwards so they look like a small neckguard. Over there is the big guy working out in white painters pants and a belt. Oh hey, look at that woman tying up a Smith machine so she can do 6 inch ROM squats. Hey, look at that guy, he is surfing Instagram on his phone for 5 minutes between sets as he sits on a machine. That old guy is bouncing his arms up and down about a half foot and calls it a shoulder press? There is the guy with no muscle definition posing down in the mirror. Hey there is that old guy that wears baggy shorts so his balls hang out. Wow, that is so awesome they are playing country music, loudly, it really helps me grind out those last few tough reps! Yes it was a bad day. 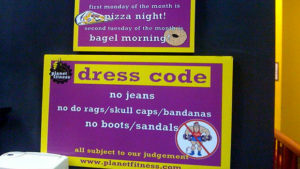 No worries, I am sure shortly I can put myself back into a trance to not let Planet Fitness madness get to me so much. I don’t even feel like posting workout specifics but it does seem like the only two tricep exercises I can do without significant pain are standing cable push downs and light dumbbell kickbacks.